Wimbledon - We will rock you! The forest this week has been greeted with chilly mornings that have suddenly bloomed into warm, sunny days at a moments notice. Our Little Forest Folk, who enter the forest in their waterproofs and warm coats, shed a few layers, don a high-vis jacket and greet the day with an energy that has been as radiant as the rays of sunshine that bathe our meadow. This week the children have been using the kitchen utensils to set up drum kits and form music bands. Renditions of Queen's 'We Will Rock You' have been sung at full volume to a beat banged out on an upside down metal bucket and saucepans have clapped together in flamboyant flare. Naturally, this has welcomed other bands forming who have wanted to invent their own songs, instruments and beats. The ability to manipulate language, invent songs, play with vocabulary and rhymes is a big milestone in language, literacy as well as expressive art and design. We may possibly have the future Freddie Mercury or Lady Gaga in the forest and even though that would be really cool, what is more important is that we have a collection of children who can express themselves and experience the sheer joy of music just for the pleasure it brings and we aim to harness this passion and carry on with it as long as the children are interested. 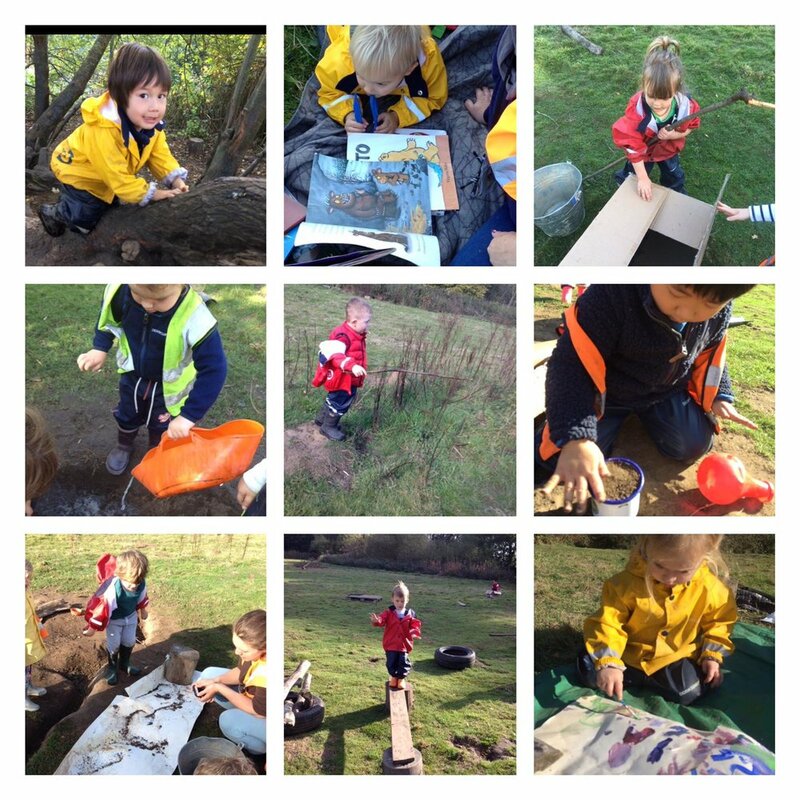 Our Little Forest Folk have loved getting their hands on water this week and have not waited on ceremony before mixing it with mud and playing with the results. It has surprised some Big Forest Folk how specific children have been in designing the perfect consistency of mud. We have seen them trial and error their mud to water ratio, adding a few more handfuls of mud until their 'gloop' has passed the test - which appears to be runny enough that it can splash when needed but also sticky enough that it can be scooped from the ground in handfuls and transported to support various construction projects. Some children have even taken this further and have worked with Abbey on 'The Splash Experiments' which have seen them splash mud on huge sheets of lining paper to see who can make the biggest splash mark. This has led to some periods of sustained shared thinking 'what happens if we add more water, will that make a bigger splash mark? What if we throw the mud from a greater height? What if we throw it at a greater speed?' This type of learning experience really helps children become masters of their own critical thinking and gives them permission to hypothesis, test ideas, evaluate and review results and make a new plan of action.